Winning isn’t always everything. Sometimes, all you can do is count your blessings. Accept your limitations and move on. Kabbalistically, the Five of Swords tarot card is known as the Lord of Defeat. 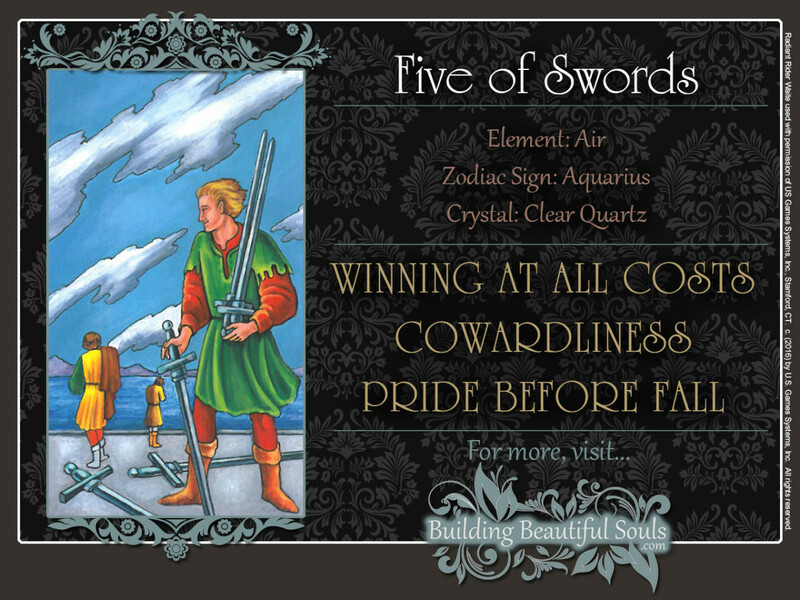 Whether the winner is you or your opponent depends on which figure in the Five of Swords card represents you and what you were hoping to gain from this confrontation. If you are about to enter into a conflict, it is in your highest and best interest to be very clear about your objectives and how much you’re willing to sacrifice in order to win. Happy-go-lucky Venus is paying a surprise visit to Aquarius, but catches him in one of his infamous moods. The two retreating figures in the Five of Swords are dressed in Yellow, symbolizing intellect and spirit. The winner with the smug grin who’s gathering up the swords is wearing Red and Green, colors that represent passion and strength. Brute force has won this fight in the Five of Swords. Reason and spiritual truths have lost out. It’s your classic high school “jocks vs. nerds” showdown. Gathering the spoils of victory, the man in the front on the Five of Swords watches the others walk toward the choppy waters and set their sights on distant lands. The water is the Abyss on the other side of which is the realm of spirit. Their defeat has taught them wisdom to pursue a higher calling. Meanwhile, in the Five of Swords tarot card the winner is still busy cleaning up the mess. Maybe he hasn’t won, after all. His victory is a bit like the story of Archimedes’ death. The most prolific genius of his time, he is still remembered today for his discoveries in mathematics, physics, engineering, and astronomy. He even invented the first sci-fi weapon in history: a heat ray. When the city of Syracuse, Sicily was sacked in 212 BC, a Roman soldier looking for plunder stabbed him to death. That man is only remembered as the idiot who killed one of the greatest scientific minds that ever lived. Are you willing to win no matter the cost to all involved – including your own karma and soul? Win or lose, the outcome of a conflict can teach you a lot about yourself. For example, where your priorities are. It teaches you that sometimes, you have to choose between being on the winning side or the one that’s morally in the right. It teaches you dignity in defeat and grace in victory. In the Five of Swords, you also learn how conflicts are lost and won – and when you simply have to walk away from a hopeless situation. You can’t win every struggle. Defeat is part of life. Here in the Five of Swords, the damage is already done. The fight is over, and the cleanup is in progress. The good news is that you’re still alive. Can you swallow your pride and move on? If you can, you’ll be able to choose your next battle more wisely. Being in the right is not always enough to win. That’s why lawyers often appeal to the juror’s emotions in a trial. If you’re marketing a new product, it’s not enough that it is better and less expensive than what your competitors offer. It must be promoted with the same passion and energy that went into developing it. The Five of Swords tarot card also warns that you may lose the war, although you have won the battle. Maybe you have overextended yourself. There have been too many little disagreements, leaving you exhausted and strapped for resources. For example, if a relationship is rocked by constant arguing, it doesn’t matter who is right or wrong about what anymore. It’s no longer defined by love, but conflict. The Five of Swords card also suggests that the way in you’ve gone about winning may have cost you the trust and respect others have invested in you. Yes, sometimes you need to assert yourself with passion and strength. On the other hand, using force excessively alienates others. They may side with your opponent, just because you’re acting like a bull in a China shop. There’s no point in crying over spilled milk. When reversed, the Five of Swords tarot card points out that you are having a hard time getting over a past loss or defeat. There is a difference between grieving and obsessing over the past. Grieving is a natural coping process that eventually restores you to health. It takes time and yes, you can experience setbacks. But when you’re obsessing, there is no movement, at all. The reversed Five of Swords card suggests that you are unwilling or unable to move on and that this is interfering with your ability to lead your life. At this point, it no longer matters whether or not you’ve been given a raw deal in the past. But you’re still fixated on it. That former boss who ran you out of your job retired years ago – he may even have passed on. He or she is no longer in a position to make things right. In the end, you are responsible for your own success, and dwelling on how others have wronged you is a sneaky way of avoiding that responsibility. No, you’re not to blame for all your failures. In fact, there are many things in this world over which you have no control. But dwelling on them only hurts you. You may realize that a recent setback has actually not been a complete failure. If you’re willing to compromise, you may discover that there is still much you can salvage from a situation you believed hopeless. One business deal may have fallen through. But in the process, you gained valuable skills and important contacts. 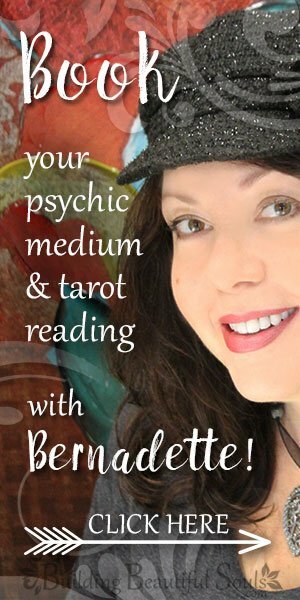 When reversed, the Five of Swords tarot card can also suggest that others may have a hard time coming to grips with your fierce independent streak. You appearance and behavior may intimidate them. That’s really their problem, if it doesn’t complicate things at your job or get you in trouble with the law. But if it does, you may find that even small compromises can make your life much easier. Kabbalistically, fives are associated with the wild ferocity of Mars. In traditional Numerology, 5 corresponds to the swift action of Mercury. Here, these energies combine to remind you that haste and destruction are a dangerous mix.